President Nicolas Sarkozy said French nationality should be stripped from anyone of foreign origin who threatened the life of a police officer. He said nationality should be revoked from people who "threatens the life of a police officer or anybody involved in public policing". 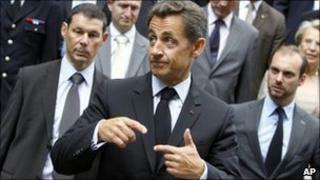 Mr Sarkozy made the comments in Grenoble, which saw clashes between police and rioters earlier this month. At least 50 cars were burnt and police were fired on. The violence began after a local man died while fleeing police, after allegedly robbing a casino. Mr Sarkozy also said that he wanted to increase prison sentences for violent crimes, and that foreign minors who committed crimes would find it harder to get citizenship on coming of age. On Wednesday, Mr Sarkozy ordered the dismantling of 300 illegal camps of travellers and Roma across France, and the immediate expulsion of Bulgarian and Romanian Roma who had committed public order offences.